Sunayana Dumala, whose 32-year-old husband Mr Kuchibhotla was killed at a Kansas bar in February, fell out of status because her permission to reside in the US was tied to Mr Kuchibhotla through marriage, Congressman Kevin Yoder said. 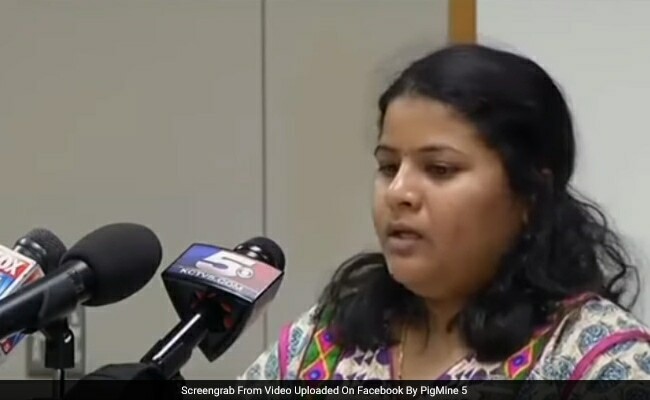 Washington: The widow of Indian techie Srinivas Kuchibhotla, who was killed in February this year in an alleged hate crime can stay in the US for now after the intervention of an influential lawmaker as she initially lost her residency rights following her husband's death. Sunayana Dumala, whose 32-year-old husband Kuchibhotla was killed at a Kansas bar in February, fell out of status because her permission to reside in the US was tied to Mr Kuchibhotla through marriage, Congressman Kevin Yoder was quoted as saying by the NBC News. "We're not going to let this happen to Sunayana," Mr Yoder said on twitter. Ms Dumala managed to regain her residency status as she lost it after the murder of her husband Mr Kuchibhotla, an engineer on an H-1B visa. "When Sunayana lost her status, to me it really added insult to injury," Mr Yoder told NBC news. He later helped her get a temporary work visa of her own. "It would have been a real tragedy, on top of the initial tragedy she suffered, to attend her husband's funeral in India and then be locked out of the US because of it," Mr Yoder was quoted as sayinng by The New York Times. "This woman suffered enough. We need to fix this," he said. In a Facebook post, Mr Yoder said Ms Dumala lost her husband Srinivas in the tragic shooting at Austin's Bar and Grill in Olathe - a senseless murder no one should ever have to endure. "But because of "unfair backlogs" on green card, Sunayana was faced with the prospect of having to return home to India because of her visa status," he said. "Thankfully, we were able to help her stay for now and are working towards a permanent fix, but if our bill had already been signed into law she would likely have already gained permanent residence and would not have faced the threat of deportation on top of the horrific loss of her loving husband," Mr Yoder said. Thanking the Congressman for his efforts, Ms Dumala said there is need to fix for many like her out there. "I agree with you that many of us should join our hands and fight united for this fix. Especially all the women out there, I urge you to shed your fears and raise your voice. It will be very powerful when few hundred or thousands of them raise voice and say we don't want to be another Sunayana. We are not doing anything wrong just asking our fair right," Ms Dumala wrote on Facebook. The legislation introduced by Congressman Yoder seeks to eliminate the per-country cap for employment-based immigrants, allowing green cards to instead be given on a first-come, first-served basis. Between 230,000 and two million Indian workers are in line for a green card, which means that they could be waiting for decades, if not longer, he said. "Many of us think this is an injustice, it's discriminatory, and the system is failing people like Srinivas and Sunayana," he said arguing that the law should explicitly address people whose spouses are the targets of hate crimes. "I think we ought to have a special exception. You don't get deported because your husband was murdered. They don't come and grab you at a funeral and say, Now you've lost your status," Mr Yoder said.